With our new update of PicSender, we were able to set the feed rate at 130IPM (3302mm/min) and we used our new option in PicEngrave Pro 5 to add a Feed Rate Change to the gcode. With this higher feed rate, we were able to set the min at S10 and max S255 laser power. When using the FRC, select the Analog option instead of PWM. Input your min and max values and in "3rd axis letter", input the S there. In the "Engraving Options" select "Use Feed Rate Change" We used a 25% setting. 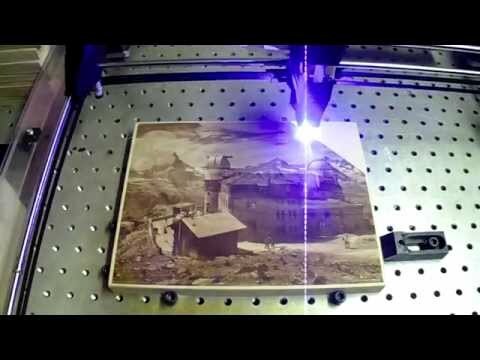 What this unique feature does, it slows the feed rate down in darker, more laser power areas and speeds up in lighter, less power areas to expand the shade range in your engraving. This was our first test with the higher feed rate and more Laser power using FRC on the EmBlaser, so it's not perfect. More experimenting with the settings is needed for improvements. If anyone that has purchased our PEP5 upgrade and/or PicSender, the new updates are now available for download. This one came out a little better. I used min 15 max 255 and a feed rate of 120IPM (3048mm/min) with a 25% FRC. What would say is the decreased amount of time by using this method? The decrease in engraving time will vary from image to image based on the shades. If the overall image is darker, it will Increase the overall engraving time more then a lighter image will. Judy was set in PEP5 at .006" Pixel Resolution, 45D engraving angle, 120IPM feedrate, 25% Feed Rate Change, Min 10 and Max 255 on Poplar. The engraving size is 6.82"X5.25" and took 1hr 54min & 36sec to engrave. This one was done at 110IPM, 25% FRC, .006 PR, Min 10, Max 255 at a 45D angle on Poplar. There is 984,377 lines of X,Y,S & F code in the file and PicSender streamed it to the EmBlaser flawlessly. Same settings in PicEngrave Pro 5 as the previous engraving. Getting very consistent results. I used the same settings as the prior two engravings, except for using our extended edge option in PicEngrave Pro 5. The "Width of Pixels" setting was set at 20 and since our Pixel Resolution setting was .006', the EmBlaser ran .120" past the engravings edge. The power will go to S0 in this area also, so no burning occurs past the engraving. When running at higher feedrates, the instant reversing inertia can cause vibrations which can effect the engravings edge image quality. Our new release of PEP5 version 5.0.07 now has a settable feedrate for the extended edge to reduce any stresses on the machine's mechanics and belts when instantly reversing. Since we used 110IPM feedrate to engrave, we set the extended edge feedrate to 60IPM. The extended edge and feedrate settings are in the "analog" option which will generate the gcode for the EmBlaser. If any backers have not tried our our full Image to Gcode program PicEngrave Pro 5 yet, you can download our Demo and try it before your purchase. We have a special upgrade offer for all of our registered PicLaser Lite customers and it can be purchased here. We have a request to post a screenshots of our PicEngrave Pro 5 settings we used and that is a very good idea. The first is the settings in Inches and the second the settings in Metric. The Initial Image Zero is set for lower left. I left the X&Y Start position settings at zero. With the Left-45D Engraving Angle selected, it will start at the lower left corner where you zero the X&Y axis on the EmBlaser and will engrave up and to the right from there. This would be true for Horizontal & Vertical Engraving Angles also. If Right-45D is selected, the X&Y zero place will be at the same position (lower Left), but will start engraving at the lower right corner and will engrave up and to the left from there. The X&Y Start Position setting will offset the starting engraving place so it will start engraving the same as described above, except with the offsets. If the Center Initial Image Zero is selected, all positions in the gcode will be referenced from the center of the image & engraving instead of the lower left. The X&Y axis will need to be Zeroed in the Center of the engraving also. The starting places and engraving paths, will be the same with the different Engraving Angles as using the Initial Image Zero set to lower left. If my instructions are not clear, or anyone has any other questions, please ask them here. Here is the downloads for our instructions and tutorial for PicEngrave Pro 5 also. If the extended edge option is used in PicEngrave Pro 5, the values and machine movement will go past the image engraving dimensions/size, so make sure you compensate for this added movement distance when you set your starting X&Y zero place so it does not exceed your EmBlaser's max travel limits. I still find it crazy that your speed is that quick and that accurate. A month later and I'm still having issues burning at such a rate. Took me 6 hours to burn a 6"x8" image and the quality is not nearly as detailed as yours either. I've input all settings as you recommended and at this point I'm just glad its burning any images at all, lol. I know the type of wood has a lot to do with how engravings turn out but is it possible to post some of your results so Jeff and John can maybe give you some suggestions on how they can be improved? What was mentioned by DL, the type of wood has allot to do with the outcome. Harder to burn types of wood will require slower feedrates and different min settings. I always try to use a 255 max setting, but set the Min higher for harder to burn materials because the lighter shades will be harder to burn. 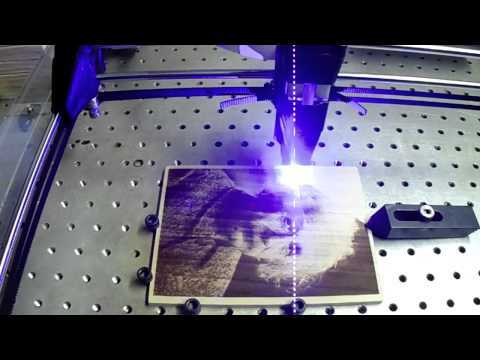 The focal point size of the lasers beam effects the detail and engraving speed. The smaller you are able to focus the beam, the more intense the burning power is and the faster you can set the feedrate. This will bring out more detail also. If you are using the Pixel Resolution that I am using, but your burn line (focal point) is larger then we are getting, the burn lines will overlap too much and you will loose detail. The settings I show in this thread are for using PEP5 with our Feed Rate Change setting. The feedrate needs to be set lower if your using PicLaser Lite. This thread will give you a better idea of the PicLaser Lite settings to use and has an already edited test image that you can download. Editing of the image is very important, but is hard to teach someone how it needs to be done because each photo needs to be looked at and edited on a one by one basis. Starting out with larger and higher resolution images then reducing the size gives better results then starting out with smaller, lower resolution images and trying to increase the size to engrave. I always sharpen an image between 12-20 in our editor. It may look too sharp on your monitor, but it will bring out more detail when engraving. A minimum of 100dpi resolution is recommended for any image that is used. Higher DPI images will require more sharpening. With most images that I use, gamma adjustment is all that is needed. The darker you make it, the overall darker it will engrave. The lighter you make it, the overall lighter it will engrave. This was engraved with a slightly different Feed Rate Change setting in PicEngrave Pro 5. We used 30% this time to bring out darker black shading. All other settings were the same as our previous photo engravings. We backed off the Feed Rate Change to 20% and cropped the image to fit on the piece of Poplar wood we had. Here is the original image. You mention the focus of the laser. When I was setting the lens focus initially, I screwed too far and it came off but I screwed it back on. It seems like the tightest focus I can get has the lens quite close to falling off. Do you have any tips on getting the absolute tightest focus? I used the focus tool, like how the user manual suggests and I think I'm getting the best focus but I'm not sure how small the dot can become. The lens will come close to coming out of the laser module when it's focused. 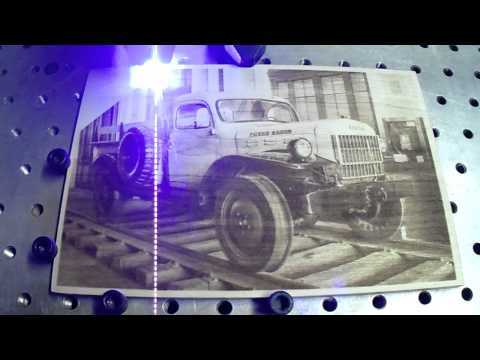 We have been able to get a .005" (.127mm) burn line when running a feedrate between 90-110IPM engraving photos on wood like our examples. If running slower and on different materials like you are, it may be slightly wider. I would recommend some teflon pipe thread tape wrapped around the lens threads so it's tight in the module without any movement when engraving. If it's loose and moving, it will effect the engraving quality. Another option that we use is hot melt glue around the outside of the lens thread to the module/heat sink so it does not move. Thanks for that, I may experiment a little using your suggestions! Another engraving example. Settings were 110IPM, Min 10 & Max 255, .006" Pixel Resolution, 25% Feed Rate Change, engraved at 45 degrees and on Poplar again. Did this one on Birch Plywood and since it burns slightly easier then Poplar, we set the feedrate at 125IPM (3175mm/min) with a 25% Feed Rate Change. Power settings were Max 255 & Min 10 and we used a .006" (.1524mm) Pixel Resolution. The engraved size is 9.75" X 7.75"(247.65mm X 196.85mm) and took 4 hours, 17 min and 49 secs to complete. Here is the original image we edited and cropped to fit the material we had. There are 2,111,201 lines of Gcode in the file and PicSender streamed it to the EmBlaser flawlessly. What streamer are you using? The open source ones may execute the lines of raster gcode slower then our PicSender streamer does. I am using your program. I could not tell if your a registered user of PicSender by your forum name and that is why I asked. Looks like the last image link I posted is broke. Here is a new one. I cropped part of the original image out to engrave it, so what size did you engrave it at? That may have effected your engraving time. Problem solved. A .0025" (.0635mm) Pixel Resolution was used in PicEngrave Pro 5 instead of .006" (.1524mm) which is more then twice the amount of gcode lines to process and less then half the stepover on each pass. You have the Feed Rate Change set at 80% and it should be 25% for engraving images. 80% will cause it to burn real dark by slowing the feedrate that much, or even cut into your plywood like in our 3D engraving thread. Have you tried it with the 25% Feed Rate Change setting yet? 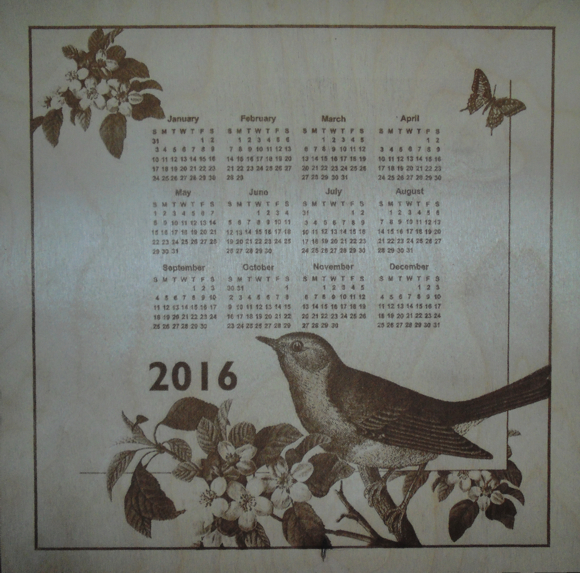 We needed a new 2016 Calendar for the office, so we decided to laser engrave one on 1/8" Birch Ply. I have recently bought , built and ran the test cut of an Emblaser A3 unit. I am keen to do a picture, being a complete novice I have struggled. I downloaded the trial PEP5+ & PicSend. After a lot of difficulties I tried using your pep settings in inches, As with my previous attempts picsend finds errors at every line of gcode, can you point me in the right direction? Simon UK.